Plant-based eating is about creating food that is as simple as possible, relying on the natural flavors of plants to trump the need for too much added fat, salt, or sugar. Today, I wanted to share with you a couple of vegan delights that I not only love, but that are healthy, too. Let’s start with the gorgeous truffles you see pictured above and below. PuraTea Water is a fair trade tea shop strategically placed next to a vegan restaurant. (Remember my post about Sage Kitchen and its connected tea shop? Perhaps this is a trend?) As the name suggests, PT sells many varieties of tea and fresh herbs. One of the co-owners makes these truffles as a special treat, sitting at checkout. My husband knows the way to my heart and picked up a bunch of these precious goodies while out shopping with our son. The best part? These “desserts” are guilt-free powerhouses of nutrition! Animal product-based truffles are, of course, wonderfully delicious (see my cherry cordial smoothie post), but most are nothing to write home about in the way of nutritional content. 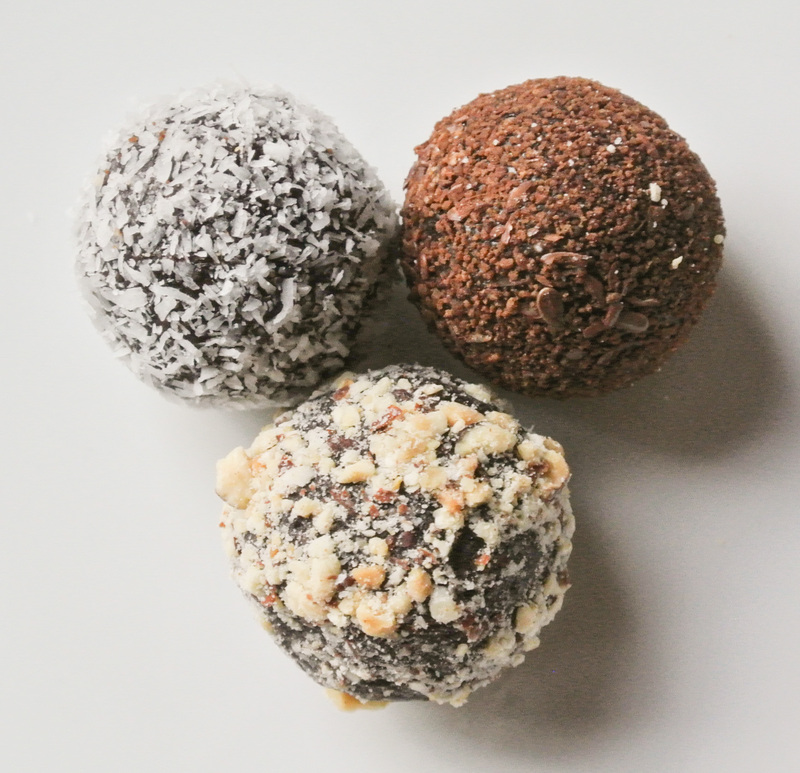 The homemade truffles at PT contain such super foods as dates, seeds, cocoa powder, and nuts. They are minimally sweetened with agave and taste very similar to my protein-packed power balls. I ate them for breakfast this morning paired with PT’s iced apple spiced chai. 🙂 Yum! Upon leaving the tea house, Travis and Nolan wandered into Loving Hut, a vegan chain with over 200 locations around the world. LH’s ethical and environmental stance on plant-based eating makes them a winner in my book. Plus, even though there are some processed items on the menu (gotta watch out – not all vegan food is created equally) there are some fantastic fresh eats, too. 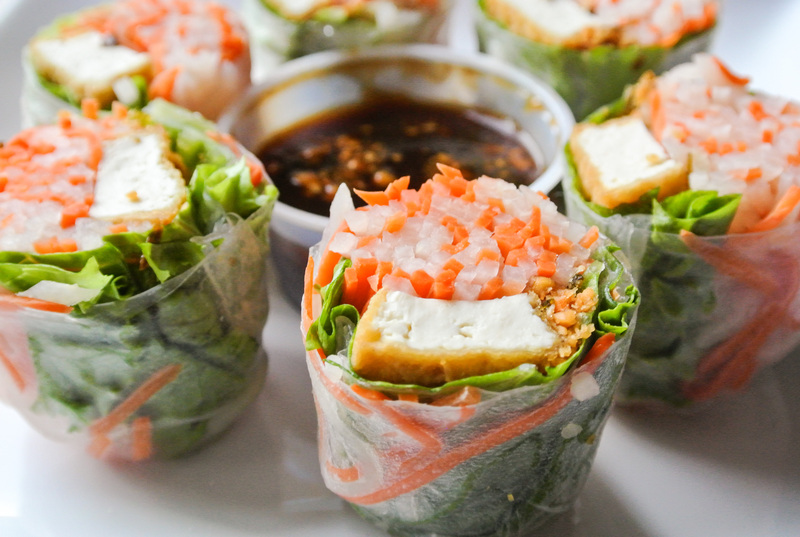 These spring rolls are one of my favorite vegan takeout items ever. 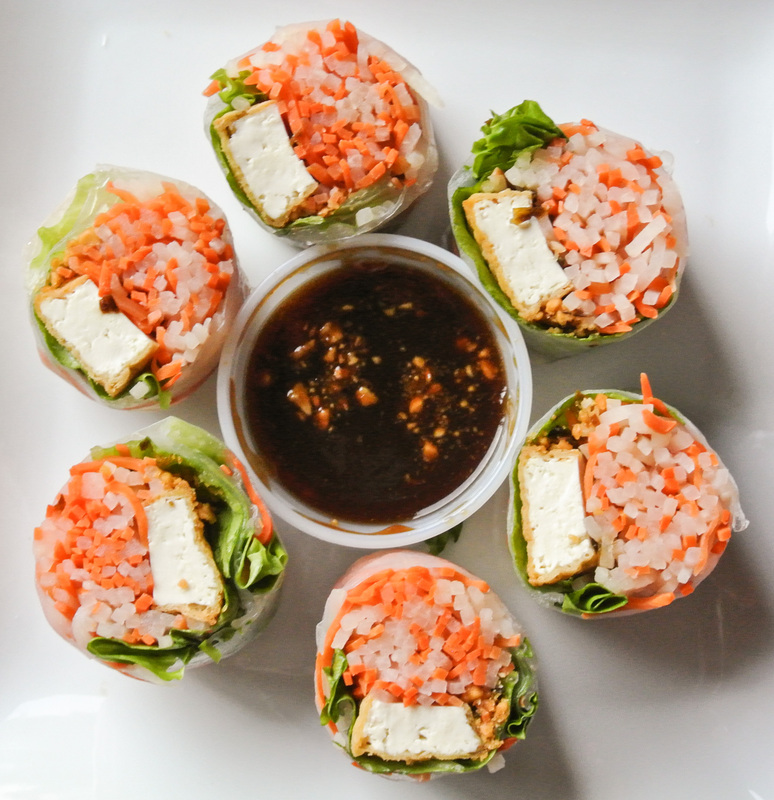 Fresh vegetables and tofu are rolled in rice paper and served with a sweet and savory peanut dipping sauce. As I always have my Fresh Formula thinking cap on, I would include unbreaded tofu since the moisture in the surrounding vegetables negates the purpose of a crunchy outer coating. Really, though, I shouldn’t complain…these are vegan bites at their nearly best and I could seriously eat them every day! Travis and Nolan coming home with two of my favorite things last night (plus having flowers delivered to the house during the afternoon, if you must know!) was pretty fantastic, but there was extra icing on this cake: The sweet folks at PT were excited about my blog! I started The Fresh Formula to help ordinary people like me live healthier lives, so the more people I can reach, the better. Look forward to seeing what the future holds. Go green!